This striking tomato dish is a decadent take on the classic Italian Insalata Caprese which, in its simplest form, is tomatoes, fresh mozzarella, basil, salt and olive oil. If serving this as a first course for a dinner party, make the dressing and balsamic reduction in advance and slice the tomatoes, mozzarella and basil before your guests arrive. Then, when you're ready to serve, drizzle on the dressings and sprinkle with basil. Pig + Fish in Rehoboth Beach, Del., serves this as a starter, and we almost always begin our meals there with it, since it is so good. The decadence comes from the dressing: rather than just olive oil and salt, this dish has a honey-mustard basil vinaigrette, plus a drizzle of reduced balsamic vinegar and more fresh basil as a topping. When reducing balsamic vinegar, be sure to use a good one. If it doesn't taste good to you out of the bottle, imagine how unsavory it would be if further concentrated. 1. Pour the balsamic vinegar into a small frying pan. Heat over medium heat until it begins to gently boil. Continuing cooking and watch as the vinegar reduces--reduce by about 4 times so there is a little more than a tablespoon. Pour thickened vinegar into a small container and set aside (it will further thicken as it cools). 2. Whisk together the olive oil, white wine vinegar, mustard, honey, chopped basil, salt and pepper. 3. Arrange the slices of tomato on a large plate or platter and place a slice of fresh mozzarella on each tomato slice. Spoon a tablespoon of dressing on each pile. 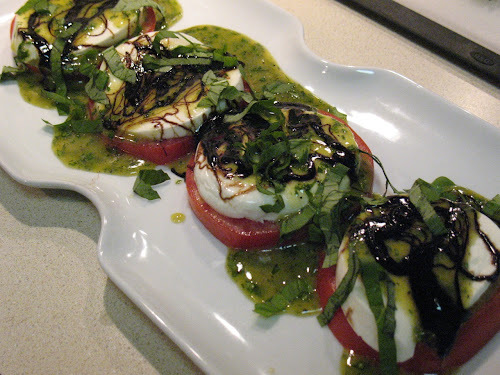 Drizzle with a teaspoon of the reduced balsamic vinegar and top with a sprinkle of fresh basil ribbons. Yum! I love the honey-mustard basil dressing. What a good idea to bring those flavors together.